Chances are if you are reading this, you are waiting for something. I remember early on in our recovery from my infidelity, it seemed that I was waiting mostly for some sort of relief from the circumstances I had created. I was lost in a complete shame spiral, and I wanted relief! I wanted the pain to go away. I have to admit now, I also was so ready for my husband to not be in pain anymore. I humbly can't even say I was healthy enough that I wanted healing for us. I only wanted relief. When we first started getting professional help (our first stop was EMS Weekend), I was told that our healing would take AT LEAST 18 – 24 months. It seemed like an eternity and I pridefully figured we could beat the odds and be different. Much to my dismay, things only got worse, and they continued to deteriorate (in my mind) for the next six to eight months. I was pretty bad at this concept of radical change and honesty. Time seemed to crawl. I started to realize that relief was much different from actual healing. I started to see that things had to get worse before they got better. I began to understand that getting better did not necessarily mean feeling better. Thankfully, we are nearing the end of the window that Affair Recovery gives for healing from infidelity. However, strangely, we still have so much work to do. But one thing that has changed is my ability to wait. My ability to tolerate pain has increased. My stomach for the unknown still has me restless and anxious at times, but I am able to sit in it more. How good are you at waiting? What exactly are you waiting for? We unfortunately all live in a time when there is very little unknown. Many of us have lost the ability to tolerate not knowing. The other night we recorded the finals of the Indian Wells tennis matches on our DVR. I know this has happened to most of you….so you can probably imagine what happened to us. As we neared the end of the third set of the men's final, the dreaded "would you like to keep or delete your recording?" came across our screen. Time was out and the program ended. We didn't know who finished the set and won the trophy. But wait. We live in 2019. We immediately walked over to our phones and googled the results. Twenty years ago, we would have had to wait for that answer or just lived without knowing. We would have waited until the next day to read the newspaper. Or we would have been intentional to set aside a specific time to tune into the news to see the results. Everything is at our fingertips, and if your family is like mine, we are too dependent upon instant knowledge, instant results, and instant everything. We have lost the ability to be surprised or to be frustrated by not having an answer. Make no mistake. 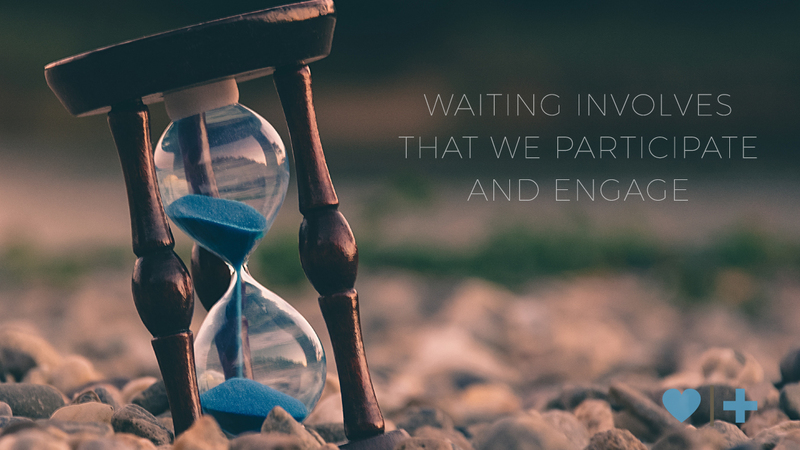 Waiting involves participation and engagement. The best kind of waiting is not passive. It will involve asking, trusting, and discomfort. Waiting and being stuck are two very different things. How do you discern the difference? Waiting for me typically can involve hope and accountability. When I am stuck, I am usually lacking in hope and closed off to others. One of the gifts that recovery will give you (even if this is the worst thing that could happen in your marriage) is the ability to learn to wait. To watch and see how things unfold. I know it won't seem like a gift. It will seem more like a painful hell. However, I dare you to try to find the gifts in waiting. Carnival rides... it is my up and down that is shocking to me.. But i am hanging on. Sue, thanks for hanging on. Sue, thanks for hanging on. And for being willing to see what God can do. I know for a fact your life is indeed precious and even though it feels like a waste, God doesn't see that whatsoever. I will pray that He uses your pain for something, even if you can't see it yet. How Do You Know If the Unfaithful Is Really Changing?